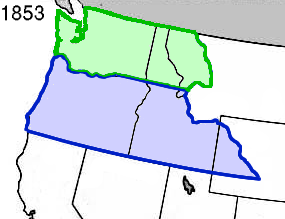 On March 2, 1853, President Millard Fillmore signed the act declaring the portion of the Oregon Territory north of the Columbia River the Washington Territory. When the bill was first introduced, the name was going to be the Columbia Territory, but Kentucky Representative Richard H. Stanton thought it would be nice to honor the first president with a state named after him, besides we already had a District of Columbia. Olympia was then, and is now, the designated capital. Map credit: Map by Matthew Trump, used under Creative Commons Attribution ShareAlike 3.0 license.